Each year the FDA detects illegal levels of antibiotics in the carcasses of hundreds of dairy cattle that have been sent to slaughter to produce meat products. Now, according to the New York Times, the FDA wonders if these same drugs might also be getting into the milk produced by these cows. The FDA’s concern over whether or not antibiotics end up in the milk on our supermarket shelves is an important one, but it’s also a question to which we’ve long known the answer as a result of research dating back over two decades. 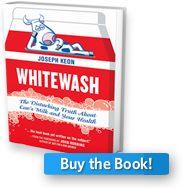 Whitewash: The Disturbing Truth about Cow’s Milk and Your Health provides details of this research. For example, in March 1988 the FDA found that over 50% of milk samples from 14 cities contained illegal levels of drugs. In 1989 the Wall Street Journal’s investigation found antibiotic residues in 38% of retail milk samples taken from ten major American cities. In 1992 the Center for Science in the Public Interest’s analysis found antibiotic residues in 20% of milk samples from metropolitan Washington, D.C.. In 1990 the FDA reported in Journal that it had issued fines to two dairies that knowingly allowed milk contaminated with penicillin, tetracycline, and sulfa drugs to be sold to consumers. Historically the FDA has only tested cow’s milk for the presence of six antibiotic drugs commonly used by dairy farmers. Yet 24 additional drugs have also been used in dairy cattle for decades. Now the FDA is talking about testing for them all. The dairy industry is opposed to such testing because it says it could force them to dispose of milk that becomes unstable while waiting for lengthy test results. The FDA estimates that of all the antibiotics sold in the US each year, 80% are used on farm animals. While some antibiotics are given to cows to treat disease, such as mastitis (infection of the udder) and others are used in an effort to prevent illness, the majority are administered because they work as growth promoters. Cows routinely fed antibiotics from the start require less feed and begin producing milk faster. This means bigger profits, sooner. The threat from the routine sub-therapeutic (in healthy animals) use of antibiotics in dairy cattle is the rapidly growing problem of drug-resistant bacterial infections which cannot be treated in humans. 100,000 Americans now die from such infections each year and the US now spends $30 billion annually to combat drug-resistant bacteria. Today many strains of the bacterium S. aureus, are resistant to all antibiotics except vancomycin. Three other bacterial species — Enterococcus faecalis, Mycobacterium tuberculosis, and Pseudomonas aeruginosa — are now untreatable with current antibiotics. This means they have developed resistance to over one hundred medications. We know that when the bacteria found in cow’s milk have developed resistance to an antibiotic, they can transfer that resistance to the bacteria in a person’s intestinal tract. Later, when the person develops an illness, the resistance can be transferred yet again to the bacteria that caused the illness through a process whereby bacteria share DNA sequences, threatening the potential for treating the disease. The FDA’s struggle with the dairy industry and its failure to effectively enforce the law regarding drug use in dairy cows has persisted for decades. As far back as 1983 three hundred scientists recognized the medical disaster on the horizon. They petitioned the FDA to ban the rampant sub-therapeutic use of the drugs in farm animals, which they knew was a chief cause of the enormous surge in antibiotic-resistant infections. There is evidence that if the FDA were willing to take action and enforce farm animal drug regulations, much would be achieved. For example, when Denmark implemented a voluntary ban on the sub-therapeutic use of antibiotics in animals in 1998, the practice declined by 54 percent. Prior to the ban, drug-resistant bacteria was found in 80% of livestock; today it has fallen to a mere 5%. It’s time the FDA took swift action to protect human health and the dwindling stock of useful medications at our disposal. While it may inconvenience the dairy industry, it is among the most important actions that can be taken to thwart the spread of antibiotic-resistant bacteria.